The first article examines the latest in PTZ camera technology. These new small, mount anywhere, cameras could be the perfect solution to capturing amazing images. And, what if smart, AI-enabled software is combined with the PTZ camera? The results might be just the lower-cost solution needed to enable the broadcast of lower-revenue sporting events, or important government meetings. The solutions discussed in these two articles are targeted at helping engineers raise the awareness of how their station’s broadcasts could be raised to network-level-quality at a local-level price point. Rise of the PTZ army. A few years ago, remote Pan Tilt Zoom (PTZ) cameras were regarded as being low quality and not suitable for professional use. Thanks to the advances in sensor, IP technology, the introduction of fanless designs and optical image stabilisers, the balance has been tipped in favour of remote cameras as an industry standard. But, exactly what can one do with the cameras? This article leads the reader through multiple examples of the new technology at work. Experts discuss locations and applications where PTZ cameras are a perfect solution. Said one provider, these cameras provide lower-cost production and do so on a consistent day-in and day-out basis. Want to know more? Read about these empowering cameras in the article, The Rise of the PTZ Camera. An overhead automated camera tracks the field action based on deep-learning algorithms. Deep learning technology is more common than one might think. This technology can be used to identify objects in images, texts or audio, achieving results that were not possible before. This article examines how deep learning is revolutionizing sports production to enable low-cost, fully automated production for semi-professional and amateur sports broadcasts. With deep learning technologies, computers can understand the sports action, opening new opportunities in sports production that were never possible before. 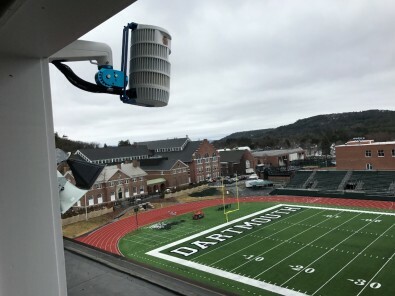 In its highest level, this technology can mimic the decision-making process of a human camera operator and video editor, providing almost the same experience of professional live sports broadcast, at a fraction of the cost. This technological revolution will allow semi-professional and amateur sport clubs to broadcast the games to their fans and even monetize their content. Want to know more? Read the article, How Deep Learning Technology is Revolutionizing Sports Production at this link.